Save on summer getaways when you sleep under the stars. Campers who stay two nights in June or July can save 50% on their next August adventure. All campgrounds are dog-friendly, many are right on the water, and some even offer site-specific reservations. (Want the coolest spot? At an altitude of 3,640 feet, Black Rock Mountain State Park is often cooler than other spots in Georgia.) Check our GaStateParks.org and Facebook often for the latest discounts. Great news for equestrians! 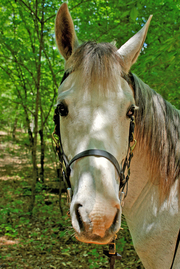 More than 12 miles of horse trails are now open at Don Carter State Park, sitting on the northern end of Lake Lanier. The system is made up of four main loops, several connector trails and even views of the sparkling lake. Riders must show current coggins paperwork at the park office. At this time, stables are not available. Call 678-450-7726 to learn more. Whether you prefer lakes, pools, rivers or splash pads, we have a spot for you to chill this summer. Kayaks, canoes and stand-up paddleboards are available for rent at most of the state parks, and members can bring their own as well. Join our Park Paddlers Club and you’ll explore six beautiful waterways, from the marshes of Crooked River to the mysterious Okefenokee Swamp. Be sure to stay safe around water by following SPLASH tips. After the sun goes down, take in the sights and sounds of summer during our “Parks After Dark” programs. We've planned a year full of nighttime adventures, such as owl prowls, full-moon paddles, sunset hikes, movies under the stars and frog frolics. Afterward, fall asleep to the sounds of crickets as you settle in to your sleeping bag or cabin. Find an evening adventure near you. Find more hikes, Junior Ranger camps, nature programs, tours and more online.